Type R (Pt–13 %Rh versus Pt) and type S (Pt–10 %Rh versus Pt) thermocouples are widely used as reference and working standards for temperature measurements both in calibration laboratories and in industry for temperatures up to 1600 °C. 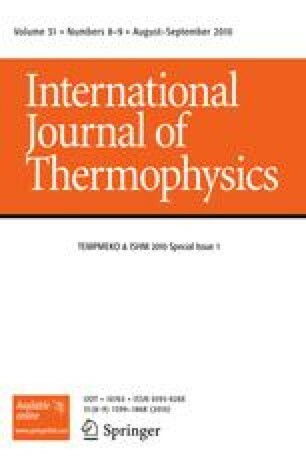 Many laboratories claim that the best achievable uncertainty is 0.1 °C up to 1000 °C and 0.3 °C up to 1550 °C, and international comparisons confirm that this is achievable practically. However, due to (i) preferential Rh oxidation of the Pt–Rh alloy thermoelement and (ii) defect quenching effects, these thermocouples suffer from reversible hysteresis in their calibration. As a result, calibration laboratories usually perform some heat treatment of the wire prior to calibration to attain a specific ‘annealing state’, at which the calibration is performed. Internationally, there are two commonly used annealing states for these thermocouples: the ‘450 °C annealed state’ and the ‘1100 °C quenched state’. High-level comparisons between laboratories in the calibration of type R or type S thermocouples will rigorously specify the annealing state in the protocol, so any systematic differences due to the choice of annealing state will be masked. This article compares the calibration of several thermocouples using the two common annealing states, finding that the difference can be as large as 0.2 °C at 961 °C, larger than the best calibration uncertainties reported. The article examines the advantages and disadvantages to the user of calibrations performed in each state, and the implications for the uncertainty analysis for calibration and use of type R and type S thermocouples.